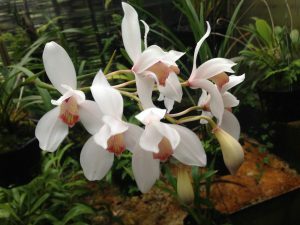 Most of our cymbidium species flower in the autumn and spring but this species is an exception flowering from July until September. 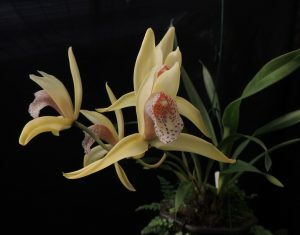 This small growing cymbidium is native to Vietnam where it grows in cool forests at around 1500m. We find this species very straight forward and reliable with the advantage of flowering relatively quickly from seed. The plant shown in the photograph flowered three years out of flask and is now carrying a seed pod for the next generation. 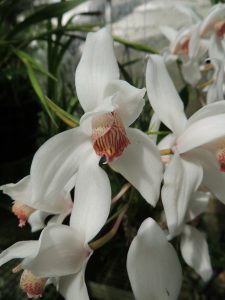 It also won best Cymbidium at our recent Orchid Festival. The species is quite variable in the size of the flower and the colour of the lip striping which varies from deep red to scarlet/orange. The white of the flowers is very white and always attracts attention.